Home-made fish fingers have more fish, more flavour and more crunch than shop bought. Well worth the extra effort. Cut the fish into strips down the fillet, following the natural lines of the fish. The strips should be approximately 2cm/1in wide and 6-8cm/3-4in long. Sprinkle some salt onto the fish. Place the flour onto a plate. Place the beaten eggs into a wide bowl. Place the breadcrumbs on another plate, and mix the chopped parsley and lemon zest into the breadcrumbs. Now you have your production line ready, take a piece of fish and dust it in the flour, next dip it in the egg (allowing any excess to drip off) and finally into the breadcrumbs. Transfer the fish fingers to the prepared baking tray and refrigerate for an hour - this will firm up the fish and make them easier to handle, and the egg and flour will set a little too. Pre-heat the oven to 220C/425F/Gas 7 and lightly grease a baking tray. Drizzle the fish fingers with olive oil. 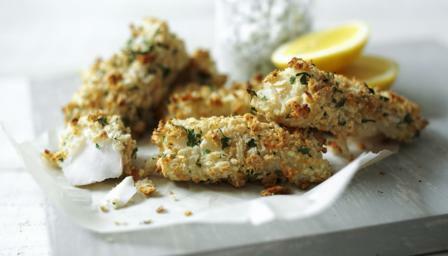 Bake the fish fingers for 12-15 minutes, or until lightly golden and cooked through. Or fry the fish in a pan, over a medium heat, with a few tablespoons of olive oil for 2-3 minutes either side until golden-brown and cooked through. Remove the fish fingers from the pan and place on kitchen paper to absorb any excess oil. Meanwhile make the tartare sauce by mixing all the ingredients together in a small bowl, and set aside until needed. Once cooked, squeeze a little lemon juice over the fish fingers. Serve with a generous helping of tartare sauce.